Built-in-Z-link Wirelee Technology transmitts signals to your MS-3 Headphones (included). Sensitivity 8 adjustments. Increased transmit power, enhanced electronics, and a 13.6 kHz operating frequency to detect a wide range of targets from tiny gold nuggets, and jewelry to large silver coins, deeper then other AT detectors. 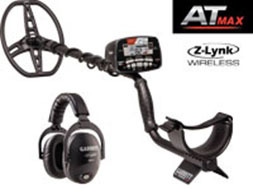 All terrain detector and submersible to 10-foot depth.